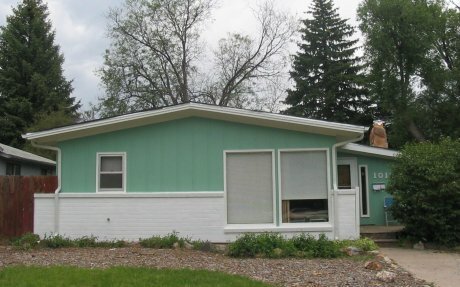 Here’s an inspiring story from readers – Samantha and Dave – who told beige to bite the dust and instead painted their Colorado bungalow / ranch a fabulous shade of Burma Jade — jadeite green — from the Sherwin-Williams Suburban Modern palette. A note on the brick detailing on this house. 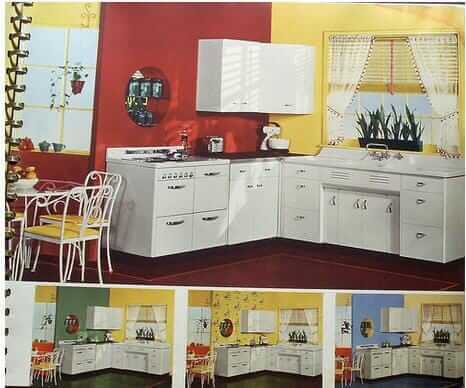 By the early 50s architects and builders were looking to create a “long and low” ranch house feel on designs of every ilk. Adding a half-wall trim like the brick that runs along the front of this house — and in some cases beyond, as in this house — accentuates the horizontal, even though this house appears to be pretty much a square box. 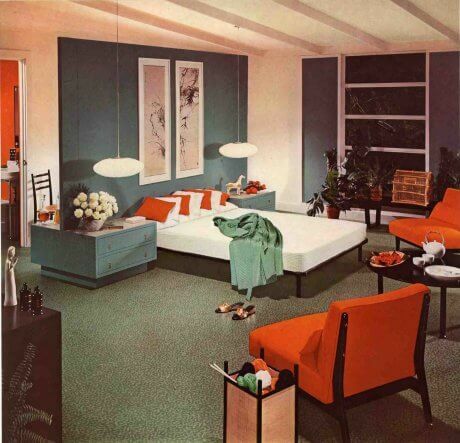 A classic classic mid-century house design trick. Click thru for Samantha’s explanation of their journey. Love, love, love your web site! I am writing to tell you our experience with using the Sherwin Williams Suburban Modern palette for our home’s exterior. 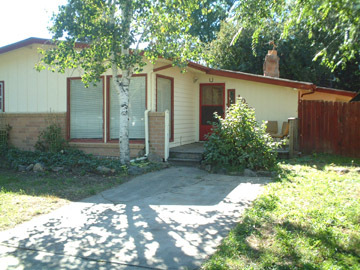 Our house is a 1300 square foot ranch built in 1959 There are many classic midcentury modern houses in our neighborhood–some “cooler” than others; that is, some have bolder color choices and seem to stand out. 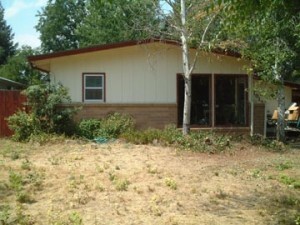 Our house before painting was yellow with maroon trim. It has a brick facade that was originally pinkish-beige. We chose Burma Jade for the body of the house, and white for the trim. 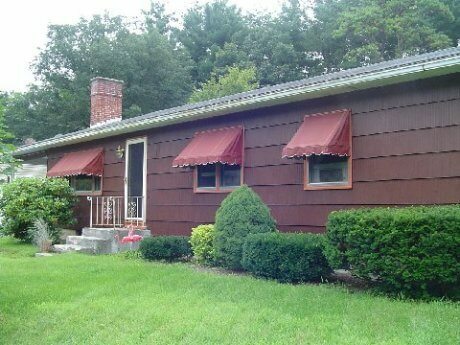 This was a classic combination according to the Sherwin Williams Suburban Modern palette. We also painted the brick facade white. When we finished, we received nice compliments from the neighbors. One woman who raised here family in the neighborhood said that it reminded her of when the neighborhood was first built. That was a big compliment, in our opinion! Some didn’t “get it.” One friend said it was an “old” color. Most people said that it went with the style of the neighborhood, so we chalked that one disparaging comment up to a matter of taste. The house looks amazing. We love the color and the fact that we don’t fit in with most of the brown and beige houses on our street. As for taking a courageous step…..it really was. We went through many color combinations before deciding to “go bold.” Initially, we wanted to use the beige color on the Suburban Modern palette, but when we tested it on the house, it looked pinkish. Not good. So after much discussion about colors, our “final” decision was white with the trim in Burma Jade. But then….we noticed that the house kitty corner from us was white with teal trim….a little too close to what we had in mind. So, at the last minute, we switched, deciding to go bold with Burma Jade as the body color and white as the trim. We love the way it turned out, even if some don’t get it. Thanks again for your wonderful website. I am addicted! Thank you, Samantha and Dave, for sharing your story. It will give courage to all of us who struggle with taking a bold step when it comes to color. Love the new colour! We are having our entryway door replaced and the contractors scraped somehow against the exterior paint and revealed this green. Going to look forward to bringing our house back to this colour.